On arrival in Delhi airport you will be welcomed by our representative & transfer to hotel. Overnight stay in Delhi. Morning free after breakfast drive to Sangla covering a distance of 500 kms / 09 hrs drive, On arrival check into the lodge or Camp near the angling spot. Dinner & overnight stay at Sangla. 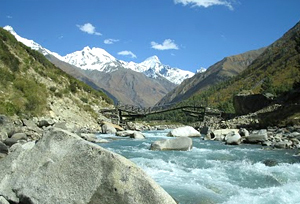 Sangla Valley or the Baspa Valley starts at Sangla and ends at Chitkul. The valley is surrounded by forested slopes and offers views of the high mountains. 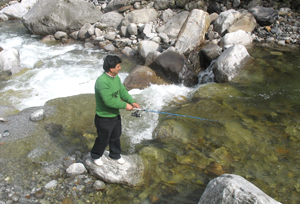 Its location in the greater Himalayan range gives it a milder climate than the plains, The Baspa River flows in the Sangla Valley which is the paradise for Anglers from all over the world. After Breakfast at Lodge, after breakfast meet with your experienced guide, brief Orientation about the area & fishing, later full day Fishing at Baspa river, Evening return back to Lodge for dinner & overnight stay. Breakfast at the lodge & full day angling at Baspa River with packed lunch. Evening return back to Lodge for dinner & overnight stay. Morning at leisure after breakfast start your drive for Delhi. On arrival in Delhi transfer to the hotel for overnight stay. Morning at leisure, after breakfast in time transfer to International airport to board the flight for home country.